Excerpt: 'The Tarantula Scientist' This latest book in the "Scientists in the Field" series, recommended for fourth through sixth grades, explores how and why researchers study the biggest and hairiest spiders on Earth, taking readers from the rainforests of French Guiana to a tarantula-filled laboratory. This latest book in the "Scientists in the Field" series, recommended by Washington Post columnist John Kelly, explores how and why researchers study the biggest and hairiest spiders on Earth, taking readers from the rainforests of French Guiana to a tarantula-filled laboratory. Don't like spiders? Other books in the series look at the people who look at gorillas, snakes, bugs, microscopic organisms and animals that live in the woods. Sam Marshall is lying on his belly in the rainforest, his freckled face just inches from a fist-sized hole in the dirt. He turns on a headlamp. He gently pokes a twig into the tunnel and wiggles it. "Come out!" he says into the hole. "I want to meet you!" Normally, it's not a great idea to poke sticks into burrows in the jungle -- especially if you don't know who lives there. Snakes, for instance, don't appreciate it. In this particular rainforest, the most common snake is the fer-de-lance. The name means "spearhead" in French, which suggests you'd better not bother one. "AVERTISSEMENT!" (French for "WARNING!") reads the rough-hewn sign at the head of the jungle trail to Tresor Reserve. The sign warns visitors to beware of snakes -- and, while they're at it, to watch out for spiders, wasps, biting ants, bees, wild pigs, slippery trails, roots poking up from the ground, and branches falling down from the trees. But Sam knows this forest well. He knows exactly what he's doing. Sam is a spider scientist, or arachnologist (pronounced "ar-rack-NAWL-o-gist"). His specialty? The biggest, hairiest, and , some would say, scariest group of spiders on earth: tarantulas. That's why he's come all the way from Hiram, Ohio, to French Guiana in South America. Just north of the equator, French Guiana is home to only 150,000 people. It's about the size of Indiana. But for its size, this is probably the tarantula capital of the world. Perhaps a dozen species of tarantulas live here, including some of the most spectacular. So far, Sam has caught only a glimpse of hairy legs in the hole. But he knows who's in there: a Goliath birdeater tarantula, the largest species of spider on the planet. How big might that be? Big enough that with outstretched legs, this spider could cover your whole face. A large one could weigh as much as five mice. This tarantula is a Goliath for sure! Sam isn't frightened at all. "C'mon, sweetie!" he calls down the hole. Sam is trying to lure the spider out. Normally tarantulas spend the day waiting in their silk-lined retreats. They come out at night to sit in front of the burrow. There they wait for prey. But by wiggling the stick as if it were a juicy worm or a scuttling cockroach -- a meal the Goliath birdeater, despite its name, would probably prefer to a bird -- Sam hopes to coax her out into daylight. There! Sam feels her grab the twig with the pair of food-handling feet, called pedipalps, next to the front of her head. "She's pretty strong," he says. He knows she's a female because he can already see how big she is. Females are bigger than males and live much longer. He wiggles the stick some more. He thinks she'll come out if the "prey" seems to be trying to get away. And he's right: "Here she comes," he announces. She thunders out of the hole! Her eight walking feet, each tipped with two claws called tarsi, patter loudly on the dead leaves on the forest floor. "These tarantulas are the jaguars of the leaf litter," Sam says. And it's true -- to the frogs and worms and insects who live here, this tarantula must be an awesome predator. 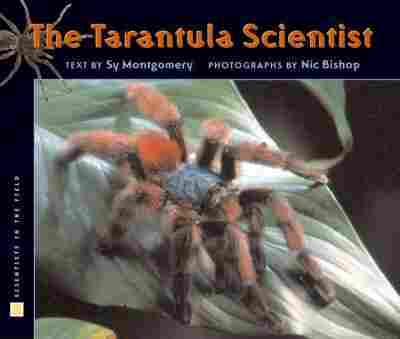 From The Tarantula Scientist Copyright (c) 2004 by Sy Montgomery. Reproduced by permission of Houghton Mifflin Company. All rights reserved.